22. Apr 2019, 16:24 Hallo Gast. This is the relative thread of the White Council game, meant to allow the participants to discuss its development, other people to give feedback and new possible users, who might want to join it, to ask for acceptance in the very RPG game. I want to give my compliments to all participants: you've so far all done an impressive job in writing, language and storytelling. It is a lot of fun to write and it helps me improve my skills of the english language. I am looking forward to the continuation of the council and the tales we will share. It is a lot of fun to write and it helps me improve my skills of the english language. I am looking forward to the continuation of the council and the tales we will share. I'm thinking about structuring the meeting in multiple events, during a span of, say, 2/3 days. The first night (until dawn) could be centred on the general discussion of the most important topics, like a main overview of the context. The second day could then be appointed to be the meeting that nominates the head of the White Council, even though I still have to come up with a suitable typology to follow (an election, a proclamation by consensus or a single member's proposal?). I guess the third and last day should deal with concrete measures to take and the assembly's final decisions. Sorry, if the progress of the game seems to be halted. Galadriel's address to the White Council will soon arrive. It's just that I was busy with other things. "This we have sworn, and not lightly"
I would post, but I've recently moved into my college (university by European standard), and my free time is at an all time low. I will make an effort to get out the next Elrond pov though. "But wherefore should Middle-earth remain for ever desolate and dark, whereas the Elves could make it as fair as Eressëa, nay even as Valinor? Of course nobody should feel any sort of pressure as a part of any of our RPG works, this is never a good circumstance for creative writing I would say. As Walküre said earlier, just continue whenever you get to it and when you are in the right mood. I look forward to how the other council members will react, but I will wait patiently until the right time has come. Would it be possible for someone to move the game along? Not immediately of course but when your time allows it, I've got a Saruman pov ready but it would work best as a reaction to something, such as somebody entering the library or the next phase of the council being called. Again, don't rush, just whenever possible, I'd greatly appreciate it. We decided to move forward to the meeting of the second day, meant to choose the leader of the White Council (elected by the majority of the members) and to indicate its precise role. Vector is willing to call for the second assembly as soon as he can; I guess you're nonetheless more than free to add your piece to the narration now, provided that it didn't refer specifically to the second meeting or that it didn't need the second meeting to begin (Elrond is the only one authorised to start the talks). I'll keep my piece for now, see if I can fit it anywhere later. Looking forward to the seconds meeting. Galadriel has accepted the refusal of Gandalf to be appointed as the leader of the White Council. After all the other members of the assembly have announced the candidate they want to lead them, we should proceed with the actual election. And, dealing with this aspect, I want to share these considerations. Galadriel is willing to abstain from expressing other preferences and she will therefore abstain from voting any of the ones proposed by the others. With her abstention, I want to give the sense that she's quite sceptical about whatever outcome is to result from that election; that is, she will never be fully convinced by the final choice of the council (and the future events will prove her right). That attitude will also introduce one of the factors at the root of the unfriendliness (destined to grow ever more manifest as time passes by) between Galadriel and Saruman: the fact that the most authoritative member of the White Council had not supported his candidacy from the beginning was always regarded, by the White Wizard, as a symbol of disloyalty and distrust in his rule. But abstention also means that Galadriel won't participate actively in the discussion that will then indicate Saruman as the most favoured proposal. 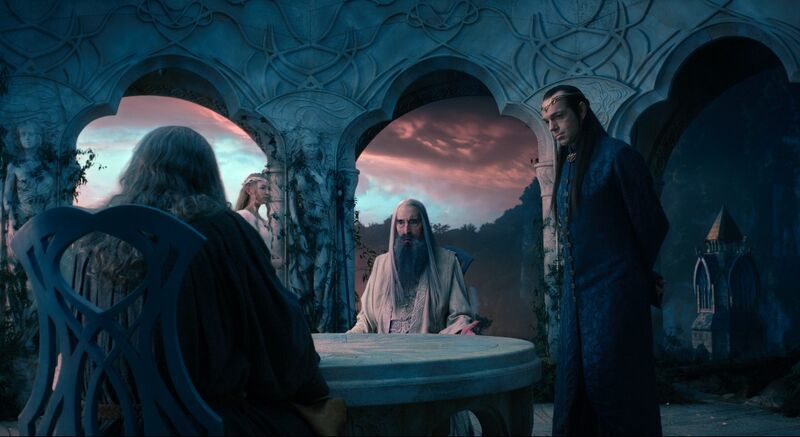 Is Elrond going to abstain as well, or will he eventually agree with the other guests about Saruman? I would really like to explore the beginning of the hostility between those two characters, starting from this pivotal occasion, even though I don't want her to seem too much passive or unwilling to take part in the talks. What do you think? Ok, I set all the pieces for the second meeting of the White Council to officially start. Before immersing ourselves in the events, I'm planning to do a brief digression (something that occurred just some time prior to the second meeting). Of course, were you to have other digressions to explore in mind (a particular adventure of Gandalf during his journeys or some reminiscences of Saruman), you're more than welcome to express yourselves. In my opinion, due to the gravity of the situation, the second meeting ought to be characterised by more resentful/hard feelings, heated discussions (via the usage of quite brief posts) and, overall, a much more lively climate. You don't absolutely have to worry about time or boundaries of space (there are none), because we can easily alter the time of the narration at our own will. Another aspect, which would certainly be interesting to focus on, could be the story-telling activity of each character, who might be willing to make the assembly aware of particular memories or happenings; for example, Fine might be keen on telling us what was like to confront Sauron in Dol Guldur. The scopes for creativity are really vast indeed, and we should consequently take advantage of that. I agree with the more serious and, in some way, passionate tone of the upcoming discussion. For Gandalf, I would like to start the meeting with him giving a full report of his foray into Dol Guldur; but I do not have any previous digressions planned. I will wait until everyone is ready to join the Council Meeting and then start if off with Gandalf's tale, if that is okay with all of you. Ok, I'm perfectly fine with that. My digression narrates an event occurred immediately after the discovery of Gandalf. It is connected with it, but it doesn't involve him directly.